Conor Moynagh and Dara McVeety are free to play in Brewster Park. Conor Moynagh (left) and Dara McVeety (right). CAVAN HAVE RECEIVED a huge boost ahead of their All-Ireland SFC qualifier against Tyrone with key duo Dara McVeety and Conor Moynagh clear to play. The red cards shown to the pair at the end of the fiery Down clash last Saturday were overturned after a successful appeal last night. 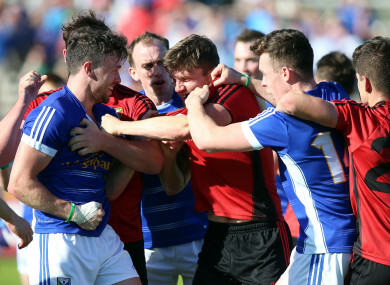 Referee Cormac Reilly handed McVeety and Moynagh straight reds — along with Down’s Anthony Doherty — for ‘contributing to a melee’ and while Cavan won on a scoreline of 1-14 to 0-15 to progress, respective one-match suspensions meant that they’d miss out. But last night, the Central Hearings Committee (CHC) cleared both players to play at Brewster Park tomorrow (throw-in 5pm), ruling that ‘infraction was not proven’. Enniskillen plays host to the qualifier after the Croke Park double-header with Kildare and Mayo was re-arranged, while Cavan’s Kingspan Breffni Park continues to undergo maintenance work. Email “Boost for Cavan as key duo cleared to face Tyrone after having red cards overturned ”. Feedback on “Boost for Cavan as key duo cleared to face Tyrone after having red cards overturned ”.